I have owned so many unpleasant umbrellas that, at one stage, I would rather put up my hood and get drenched on the way to the bus than fight with one of the nasty things. Apart from turning over in moderate wind, filling my shoe with water when emergency-closed, and getting stuck on other people's coat pockets, many of my previous so called "foldable" umbrellas had a habit of breaking in mid-fold, if used too often. So, when I was offered a folding umbrella, my expectations were low. 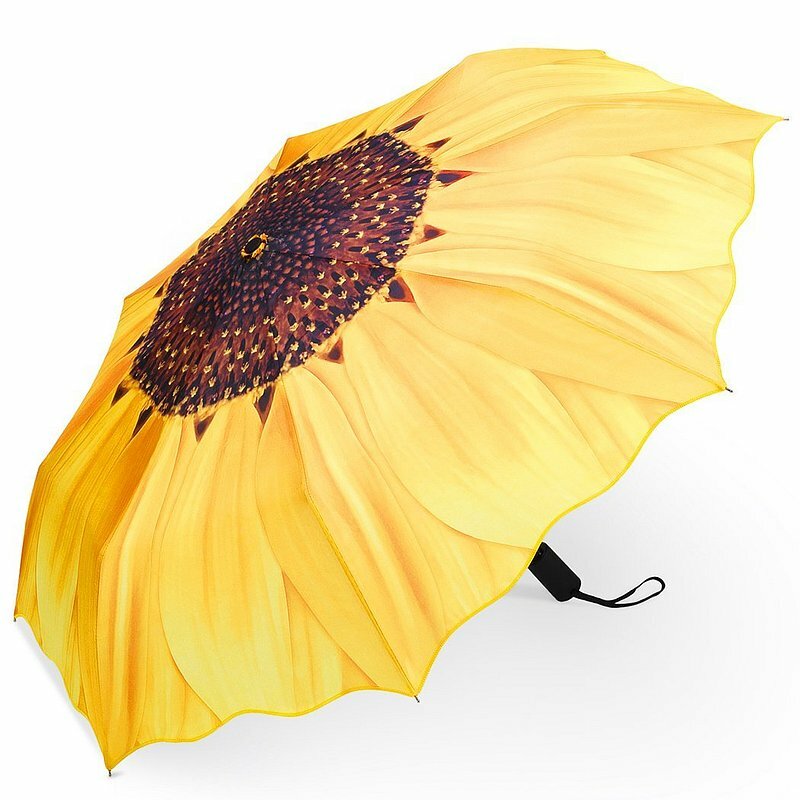 However, they are useful things to have on hand, so I took a proper look and picked this incredibly cheery sunflower design. Yellow is not my favourite colour but, in this beautiful print, it's absolutely perfect. I love the way the whole canopy is made to look like a giant sunflower, with the seed-head perfectly centred and the petals ending in a scalloped edge. There is a similar model in violet if you prefer that shade. In person, the PLEMO umbrella really impresses with its quality and sturdiness. In size, it is much smaller than my other folding ones because the ribs fold in four instead of two segments. The handle is thick, grippy and easy to hold, although quite short, and there is a loop to slip over your wrist, if needed. The same-fabric sleeve is neat and plainly made (no zip to catch bits of material) and I thought it would be difficult to push the folded umbrella back into it, but it's actually very easy. The whole thing slides back in smoothly, after tightening and securing the folds with the little strap provided for that purpose (with an easy Velcro closure). The handle and ribs look strong and capable of handling a fair wind and the mechanics are impressive. The button on the side of the handle deploys the large canopy with a strong and very fast action which took me by surprise. So beware: this umbrella needs a lot of clear space to open into. Hold it well away from you and anyone else, before you press that button! To close it, you press the same button and the ribs snap shut with ever more vigour, at the top of the handle. At this point, to complete the process, the best way to go is to place the flat end of the umbrella into your palm (or even against the ground) and push strongly until it clicks shut. It's now ready to slip into its protective sleeve but make sure you don't touch that button again! In action the umbrella performs flawlessly and shelters two people with ease. The deep slope of the canopy repels driving rain much better than the flat varieties, and the cheerful colour and happy look of the design make a rainy walk a bit less miserable. Finally, although we're not supposed to mention it, the current price is so modest that it would be easy to buy two or three, especially with such a large choice of colours and styles. Slim and well made, this is a perfect holder to keep a passport protected and handy, while organizing the motley collection of cards and papers that most men need to carry around. 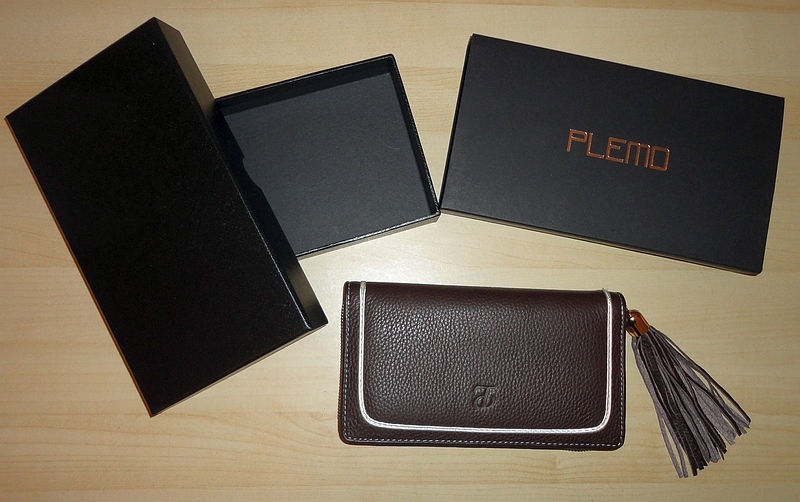 Plemo has come up with a supremely practical design in a size that should fit most suit or jeans pockets. 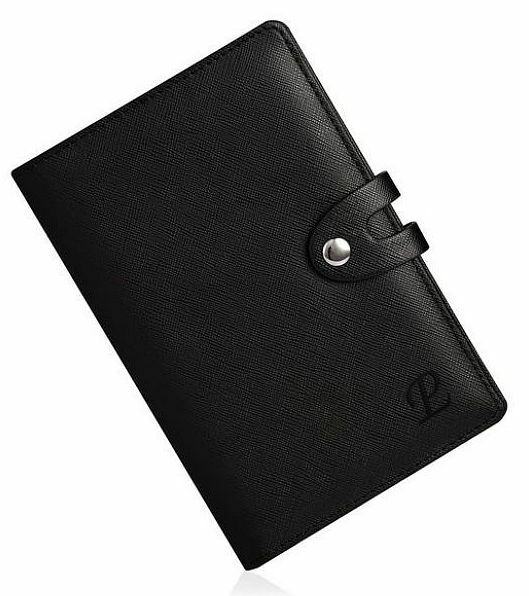 This passport holder is made of a sombre and elegant black synthetic material (PU leather), finely textured in a diagonal pattern. A lateral tongue with sturdy press-on stud secures the wallet shut. Inside, a central panel houses a passport, with one side visible through the clear plastic front and the right portion contained in a pocket. 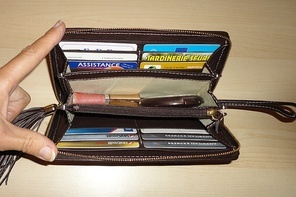 In addition, the wallet offers an array of slots and receptacles suitable for credit or business cards, bills, receipts, stamps and paper money: on the left, five pockets for individual cards (the front one with a see-through window for an ID card), plus a full side slot; on the right, four more options. The wallet also has the usual central fold spanning its full width. My husband has had a fair number of wallets over the years, usually made of leather, but he thought this one particularly useful in its design and smart enough for most purposes. The fact that you can add a passport to your other paraphernalia is a definite plus. The beauty of this item is that it is very slim and relatively small, but offers so much storage inside. The materials look tough and durable, suggesting that they can take some heavy use. It comes packaged in a semi-transparent plastic bag, decorated with the Plemo name in a slanting pattern, sealed by a plastic zip. While not as impressive as a gift box, this offers a practical storage option for the wallet. When you consider the price, this is a guilt-free and care-free purchase that most men would find perfect for the job. This is a beautiful, quality man's belt that makes a terrific first impression with its luxurious packaging and classic good looks. Although very accurately photographed, I must say that I was surprised by the impact it makes in person. 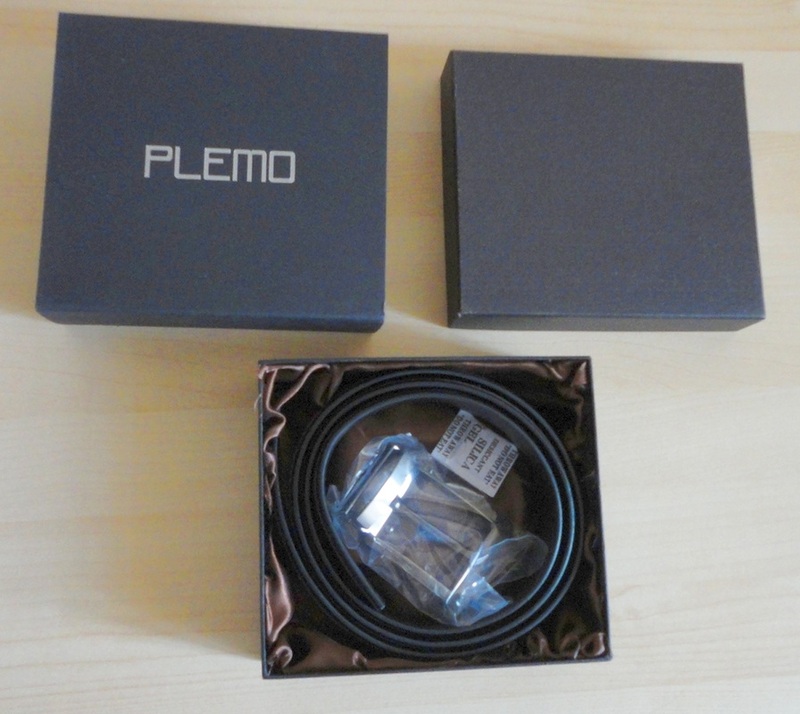 The box is bound by an elegant black sleeve with the Plemo name in silver lettering. Opening the lid, we find the belt coiled in a nest of chocolate-coloured satin with the substantial buckle packed separately in clear plastic. In colour, it is a fine-grain black with a central overlay of very dark burgundy in a larger figured leather. Stitching and finishing are first class and the buckle is a very attractive gunmetal brushed nickel finish. 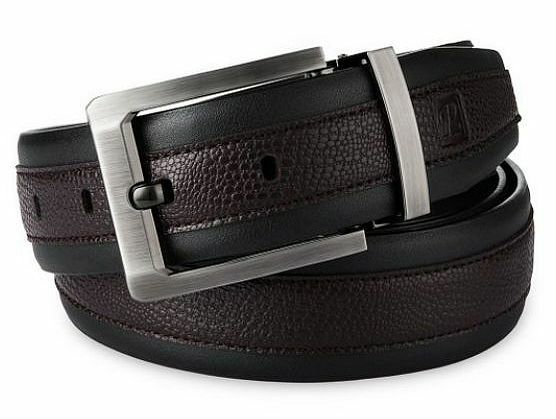 This belt is fairly wide (1.6") and works well with both formal slacks and jeans, cords or chinos. The clever design bit is that this is a fully customisable item so that you can buy this belt for anyone you want without having a clue as to their size. The length is a generous 4.3 feet and is ready to be cut to your requirements. Using a correctly-sized belt as guideline, I marked the desired length and made a clean cut with a sharp utility knife (heavy-duty scissors might work as well). I then slid this cut end in the open part of the buckle, and flipped the clip so that the serious-looking teeth bit into the leather, securing the buckle in an invisible way. A gorgeous clutch/wallet that makes a terrific first impression with its luxurious packaging and lovely detailing. You can get a pretty good idea from the photographs, but I must say that it is even better in person. It's beautifully made of supple chocolate brown leather, with elegant cream piping and a bold tassel attached to the zip closure. It is described as PU leather (usually a material at least partly synthetic), but to me it has the warm scent of the real thing. The stitching, finishing and design are all excellent, and the functionality of the inner partitions is just about perfect. I am a big fan of wallets with lots of compartments and this is probably the best I have seen so far. Even if you don't have many credit cards, there are still store cards, membership cards, and other bits and pieces that need their own slot, and everything I like to carry around with me has found a home. The clutch opens fully by means of a solid-looking gold-tone metal zip attached to the iconic leather tassel. Inside are four main compartments plus a narrow pocket at each end. There are individual slots for twelve cards and the central compartment is zipped closed to keep loose change, pens and small items secure. As a useful extra, a strong leather loop, discreetly tucked into one short end, allows me to carry this clutch securely attached to my wrist any time I don't want to cart around a larger handbag, or holdall. I can squeeze a slim face compact and lip gloss in there as well as a notebook and the usual ID and credit cards. The wallet comes gift-packed in a classy black cardboard box, bound by an elegant black sleeve with the Plemo name in silver lettering. This would make a lovely present, beautiful and practical and the price is very attractive, especially compared to similar items by certain trendy brands.